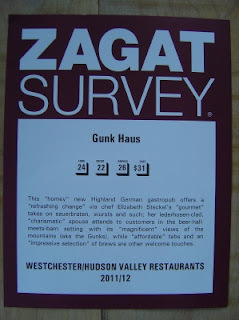 Looky, looky, what we got in the mail today: Our official ZAGAT Survey Certificate!!! We received a 24 for food, 22 for decor, and ... *drum roll* ... a whopping 26 for service!!! A big Thank You! goes to all of you, our friends, neighbors, family, and patrons of our restaurant for making this happen, but of course also to our awesome staff. Now, kids (yes, you, dear staff), don't rest on those accolades! The bar has been set, it can only go up from here, never down!! !